The past two weeks have been a sober one. 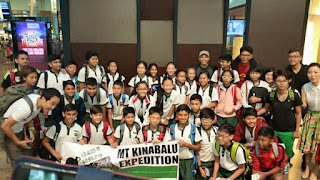 The unexpected earthquake (June 6th, 2015) that rocked Sabah had hit home in many ways, in particular, the lives of people from 18 families from Malaysia, Singapore, China, Philippines, and Japan. It is heartbreaking to see young people as young as 12 who succumbed to injuries, falling rocks, and tragedies on Mount Kinabalu. The full list of victims can be found here. In Singapore, the Prime Minister declared that June 8th would be a day of remembrance with state flags on all government building to be flown at half mast. The majority of the victims were from Singapore’s Tanjong Katong Primary School. The nine of them were student leaders and teachers on an “Omega Challenge” leadership training expedition organized by the school. The sense of loss cannot be described in words, only expressed in tears. If we were to use Michael's categorization, the Sabah quake disaster would be mostly of the “traumatic grief” category, made worse when we know that several of those who died are so young and promising. It is not only the grief per se, but the ages of the grievers that we need to take care of. In the gospel of John, when Jesus was told of the death of Lazarus, he could have done several things to get rid of the pain and sorrow. He could have saved his tears and simply say a word of healing. He could have exchanged the sorrow for joy when he intervene before the first cry. He could have summoned angels to encourage the weeping women. He could have preempted the dying in the first place. After all, he is God and he can certainly take away the sickness of Lazarus and not wait until his dying. Yet, Jesus chooses to restrain his healing until a more opportune time. He avoids the celestial intervention in order to go through together with the sisters and the people on what it means to share the grief. As I reflect on the amazing response of Jesus to cry instead of doing the actual work of healing, I find that there are at least three lessons on grieving. Singapore's Prime Minister did a very sensible thing when he announced the National Day of Remembrance for the victims of the Sabah earthquake. Some of us may recall that he is still grieving over the loss of his father less than three months ago. During that time, the nation came together to mourn and to remember the life of the great Lee Kuan Yew. It was a shared moment of sorrow that Singaporeans from all walks of life had gone through together. For an entire week, citizens cried openly. Foreigners paid their respects voluntarily. The Lee family opened up their hearts freely. It made the remembrance very meaningful and more bearable. Strangers hugged one another. People exercise tremendous patience and appreciation. The Sabah day of remembrance was no less significant, as the entire country came together in solidarity. Parents understand the pain of losing a child. Classmates support one another with whatever they can. Teachers stand in solidarity with one another. Tanjong Katong Primary School, from the Principals to the teachers, and from the staff to the students all grieve together as one. A grief that is shared echoes the song: "It ain't heavy, he's my brother." Learning how Jesus took his time to weep and to comfort Mary and Martha is a case in point. Those of us who are used to problem solving will be most uncomfortable in a situation where we simply have no solution to offer, no explanations to give, and no strategies to share. For death is not some puzzle that we can solve. It is not some examination question that we can explain. Neither is it some strategic situation where we can share our latest scenario planning. Death humbles us to an abyss of silence where tears are the de facto currency of grief. When Jesus wept, people recognize his love for them. We see Jesus incarnated and grieved among them. He too is grieving with every one of us who had suffered a loss. It is because Jesus fully participates in the grief of Lazarus's sisters that we know he can participate in our grief too. Jesus' keen discernment of knowing God's will comes from a close relationship with God the Father. He could have prevented Lazarus from dying but restrained so that he can show the world something much bigger. That the resurrection of Lazarus is a foreshadow of the resurrection of Jesus himself, which in turn is a promise that all believers in Jesus too will be resurrected when Christ comes again. For the teenagers and their friends, it can be very traumatic to hear about the deaths of their classmates. They need grief counseling. They need the maximum amount of support. They need everyone else to understand that they will experience emotional swings. They will have physical ailments like headaches, appetite loss, colds, and weird symptoms. They will also feel a sense of loss that no one will be able to understand. For grieving is not only different for different age groups, it also differs from person to person. That is why offering solutions must never be the first or second thing to do. The first thing is always accompanying the person through the grieving process by being present with them. The second is perhaps the obvious thing. Cry and weep with them. For that is what grieving is all about. Not solutions giving but accompaniment. Not giving philosophical answers but compassionate listening. Not rushing one to move from one stage of grieving to another, but to be flexible enough to let that person find himself once again.